Excellent Juggler, Master Magician, accomplished pianist, origami expert, awesome skateboarder, or just "man of many talents" - Call Ken Martin any of these names, they're all a perfect fit. 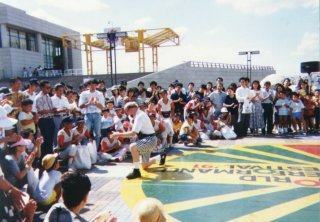 As amazing as it may seem, Ken began his performing career as a trick skateboard artist. 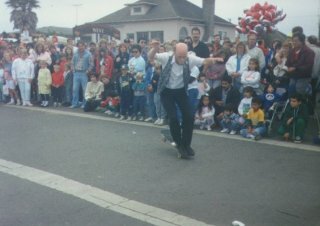 As a teenager, he developed a very polished , technical skateboard routine, and was sponsored by Z-flex, Zero Gravity, and Santa Cruz Skateboard companies.One would never guess by his mild mannered appearance, that he possessed such advanced skateboarding skills, a quality that never fails to surprise. Later, he added juggling to his repertoire, and then magic.For the following eighteen years, Mr. Miraculous has amazed and amused audiences around the world with his immeasurable skills. At present he has two specialties: close-up, walkaround magic, and a stage juggling act (that sometimes includes an edited version of his famous trick skateboarding routine). While performing, he utilizes a potpourri of dexterous stunts that leave the audience wondering if there is any end to his talents. Ken has performed in just about every venue imaginable: ski resorts, casinos, amusement parks, stage shows, corporate events, trade shows, television, residential parties, and festivals.He is able to perform his act to music, in Japanese, Spanish, and , yes, even English! Other Accomplishments include a B.A. in Psychology from the U.C. Santa Cruz, an appearance in the Warner Brothers Movie LOST BOYS, and former two time Skateboard Freestyle Champion. So, as you can see, Mr. Miraculous really lives up to his name.! See a one minute Quicktime video of Ken performing some skateboard tricks on stage!